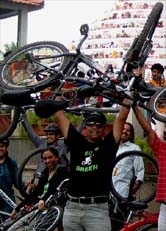 Go Green campaign ride towards chennamma circle - GGI-Group size: 4000+ Professionals, Increasing on day to day basis, Come & join us 2 serve Mother Nature. 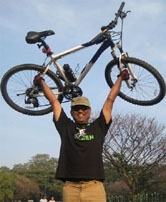 GoGreen Awareness Ride started of from Madhura colony towards Chennamma Circle Route with group of Doctors, IT/Non IT , Bank Managers , Corporates till siddharodh mutt towards karwar road and back . 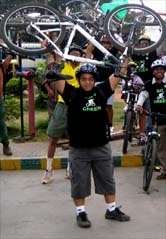 the ride started at 6 :30 am with initially 8 people till chennamma circle and the numbers increased to 15 people, this ride was part of Go Green Cycling awareness in Hubli/Dharwad City, We request all people to promote cycling in the city and save mother nature.